May was born in Raleigh, North Carolina, USA, but raised in Baltimore, MD. 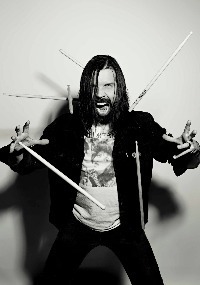 He is best known for playing drums (and subsequently bass) in Glenn Danzig's post-Misfits/pre-Danzig punk/goth band Samhain, which he joined in the summer of 1985. May played on the group's best known release, November-Coming-Fire as well as Samhain Live '85–'86 and the bonus tracks on the 2001 re-release of the band's last album Final Descent. During his long and continuing music career he has also recorded and performed with such popular artists as Tiger Army, Son Of Sam, Dag Nasty, Lee Ving, Pat Smear, Exene Cervenka, Cold Cave, Reptile House, Jackass star Chris Pontius, and Distorted Pony. London is currently playing drums with US Black Metal legends, Ritual.